This is part two of my review of my cruise aboard Royal Caribbean’s Liberty of the Seas from Galveston. Last week, I explored the ship itself, and some of the activities on board. In this installment, I provide a virtual tour of our stateroom, a “Spacious Ocean View Stateroom with Balcony”. In addition, I’ll talk about our dining experience aboard the ship. Please click here for the introductory post and index. Just like a hotel, cruise ships offer various categories of stateroom, at various price points. On the Liberty, rooms range from simple interior rooms to the lavish Royal Suite. 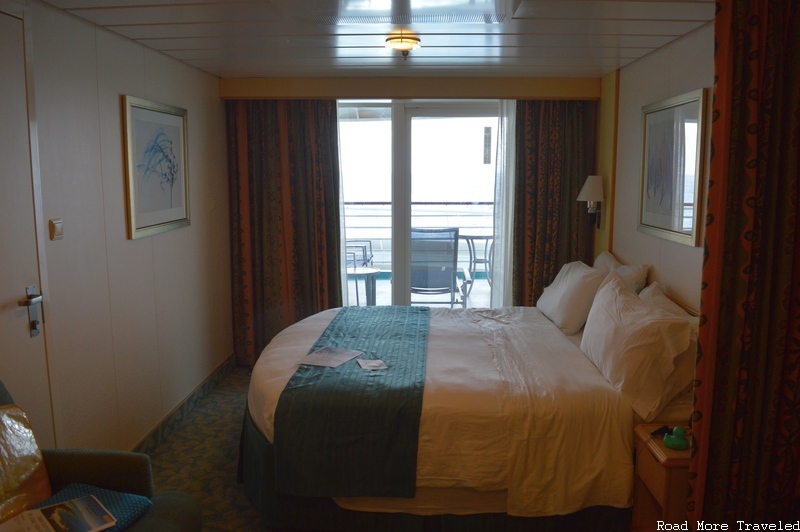 New cruisers, beware – staterooms are tiny, relatively speaking. Room sizes ranges from 150 square feet for an interior room, to 1,633 for the Royal Suite. Meanwhile, the bigger the room, and the better the view, the more you pay. For our cruise, basic interior rooms ran ~$450/person, while the Royal Suite would set you back a cool $5,000 each. If your party is more than two, third and fourth passengers usually a quarter to third of the fare for two. Also, prices differ based on your location within a particular deck. “Mid-ship” cabins carry a premium, compared to “forward” and “aft” cabins. 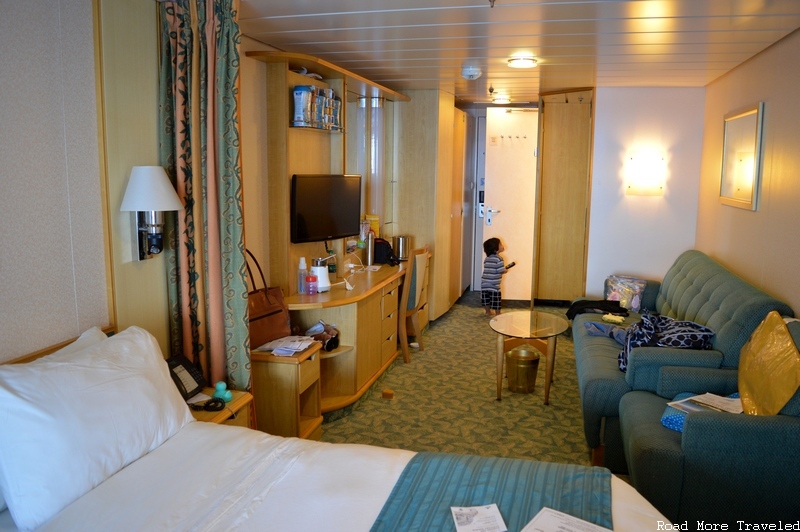 Our stateroom measured 199 square feet, with an oversized rear-facing balcony. That set us back $1,082 each for the first two passengers, and $641 for the baby. Note that although cruises historically came with fairly generous cancellation policies, this is starting to change. In the past, cruise lines asked for a deposit at booking, though this was fully refundable until 60-90 days before sail date. A sliding scale penalty applied for cancellations after this date. Recently, cruise lines introduced deeper discount fares, but with nonrefundable deposits. Always check the deposit requirements carefully before confirming your booking. In our case, we booked a fare with a refundable deposit of $750. Our stateroom, number 1704, was at the far aft (rear) of Deck 10. One semi-downside – with the stairs/elevator located mid-ship, this meant a long walk down the corridor. Meanwhile, guests can choose their bed setup between two twins or a queen. We chose the queen bed. The bed was surprisingly comfy, though it is a tight squeeze to get to the balcony door. The space next to the bed in the living area also made for a nice space to set up a travel crib. We brought our own crib, mainly because I forgot I requested one when I booked our room. The exact same model Graco crib we use was waiting in the closet when we arrived. Oops. Oh well, it actually came in handy, since mom could keep one in her room as well. One thing I really liked about this room were the numerous nooks and crannies above the desk to store things. When you’re packing boxes of cereal, tubs of food, and bottles, and don’t want them “finding” their way overboard, nice high storage areas come in handy. One thing I didn’t like – the plug layout on the desk. For one, the desk height is within easy reach. Not good when you have a toddler obsessed with grabbing your phone. Also beware, if you have a bottle warmer, it’s tough to keep the steam away from the heat detector. That’s because it’s right over the desk. There is a small refrigerator below the TV. It doesn’t get things particularly cold, but is enough to keep water or sodas cool. We found it handy for grabbing pints of milk from the buffet and storing them for later use. The bathroom, meanwhile, is really tight. That’s just a fact of life on a cruise ship, unless you swing for a suite. The shower did get plenty hot and had good water pressure, which is a plus. I saved the best part of the stateroom for last. This particular cabin came with an oversized, rear-facing balcony. It’s unusual to find rear-facing balconies without getting a suite, so I jumped at the chance. Boy, was I glad I did. Take a look at this view just from the door. Head to the railing, and enjoy a most relaxing view of the ship’s wake. There’s also plenty of space to lounge with two full-size loungers, and two smaller deck chairs. It certainly was baby approved. Because the balcony is oriented slightly back due to the deck below being longer, it is fully enclosed from the weather. That can make it a little chilly while in the sun’s shadow, but really comes in handy when it’s raining. You’re too far back for the rain to get you. And of course, the sunsets are free. As far as safety out here, use caution with small kids near the railing. Though plenty high (about 5 feet), a small child can get arms or legs through the bars. That’s going to hurt. Or at the very least, result in projectiles falling on your neighbors below. The step from the room to the balcony is easy enough even for newer walkers, though. Though I normally don’t do this, I did purchase a one device internet package. The reason? Mom was working on a house purchase, and I didn’t want her to worry about missing an e-mail. I gladly spent the money to buy her peace of mind. Believe it or not, RCCL’s “Voom” internet package isn’t bad. It provided more than enough speed for web browsing, streaming music, Instagram, Outlook, etc. You can also split the access pretty easily between multiple devices. You can only use the access code on one device at a time, though. The system will boot the existing device off if someone else tries to log on with the same code. The cost for internet is $12.95 per day if purchased in advance, or $17.95 if purchased on-board. Or, you can get a $2/day discount by purchasing a bundle with a beverage package in advance. All staterooms, regardless of category, receive a “stateroom attendant”. This crew member is responsible for servicing your room daily, bringing special requests such as ice, etc. Our attendant was really good, very attentive and proactive. By the second day, he figured out our schedule (breakfast at 8:15), and made sure to have our room made before our return. I asked for ice on the first day, and he brought a fresh bucket each evening without further prompting. And of course, he made some cute towel animals. If you want to splurge, Royal Caribbean also offers a variety of paid options. You can see the full list here. These include anything from premium coffee drinks at the coffee shop, to a full steakhouse experience. Personally, I fail to see much value in the paid dining options. We’ve tried these on previous cruises, and found them underwhelming. One thing I do suggest, though, is purchasing a “soda card”, known as the “Classic Soda Package”. These cost $9.95 a day if purchased in advance, and allow you to order unlimited fountain sodas, both in the bars/dining rooms and at Coke Freestyle machines on the ship. Sodas normally cost $2.50 each, so if you consume four or more between the two of you, you come out ahead. Should you want a package including adult beverages, RCCL offers that, too. The Ultimate Beverage Package costs a pretty penny, though, at $59.95/person/day. This adds unlimited alcohol (up to $12 per drink) in addition to soda and premium coffees. My advice: think how much you plan to realistically drink before buying one of these. You usually need to consume 3-4 drinks per day to make it worthwhile. Technically, multiple guests in one stateroom can’t share a single soda card. In practice, the wait staff and bartenders don’t enforce this, though. So how do they know if you purchased a soda package? Your stateroom key includes a “Coca Cola” emblem or sticker on the front. Also, you receive a special plastic soda glass. Usually, just show the glass, and your waiter will bring you a soda. Some do ask to see the sticker on your card, though. The ship’s buffet, Windjammer Café, is on Deck 11. The café follows the familiar layout seen on all Royal Caribbean ships. It consists of various live stations, usually a grill, an “ethnic” food section that changes daily, daily soup specials, comfort food like grilled chicken and vegetables, and healthier options like a salad bar. Breakfast, meanwhile, consists of your typical hot and cold options. Helpfully, this includes hot milk, which came in handy to take with us on shore excursions. We brought Ashok to the Windjammer for breakfast and afternoon snacks daily. He took to the cream of wheat at breakfast and some soups in the afternoon. Otherwise, I found the quality mostly average. Due to general crowding, I couldn’t get many close-ups of the food stations. However, here are a couple, and one of the seating area in general. The buffet gets REALLY crowded from about 7-8:30 am on shore days. Otherwise, it wasn’t too bad. We never had issues finding a table for the three of us. Service, though, left something to be desired. Unlike previous cruises, the wait staff weren’t proactive at all. You had to constantly flag them down for drink refills and such. Not a big deal, but disappointing since cruise lines usually pride themselves on service. We took dinner nightly in the main dining room, along with lunch on sea days. Royal Caribbean offers two types of main dining. “My Time Dining” allows you to dine when you want, but without a set table. Traditional “fixed” dining comes with a set time of either 5:30 pm or 8 pm, with the same table each night. My wife and I typically eat late, so initially, I choose the 8 pm fixed dining. But a couple of months later, it dawned on me that this would be a disaster with the baby. I forgot to call to change to 5:30, though, so I ended up having to take my chances on the first day. No tables were available at the 5:30 seating, so we had to take “My Time” dining. Lunch is first come, first served. You can minimize your wait, though, by volunteering to share a table with strangers. The host will ask when you check in. If you select My Time before sailing, you can make reservations online. Otherwise, you can call for reservations the day of, but unless you want to eat at 5:30 or after 9, good luck actually getting one. Fortunately, the head waiter on the first night really went above and beyond. He made sure we could get the same table in the corner each night at 5:30. That proved helpful, because Ashok was unusually fussy, so we at least minimized disturbing neighbors. I have to say, I was quite disappointed with the quality of meals in the main dining room. My previous experiences on RCCL set the bar high. We had great meals, even the special Indian vegetarian ones some in my family order. But this cruise just wasn’t up to snuff. Tough, overcooked prime rib set things off on the wrong foot from day one. Appetizers also generally disappointed, like this decent looking but dry, flavorless crab cake. Soups rated higher, though. Cold options generally beat the hot ones, but even there, the cream-based hot soups were usually nicely done. Desert was a high point, at least. This apple tart with ice cream sure was tasty. Our headwaiter, also from India and perhaps sensing our disappointment, took matters into his own hands and brought my wife and I impromptu Indian options on some nights. The best dish was probably this biryani. Good flavor and spicing. Overall, though, poor main courses and starters made dinner disappointing overall. On the other hand, we certainly did receive excellent service from both our waiter and headwaiter. Both were good with our baby, and did the little things like cover up our plates if my wife or I had to take Ashok out for a few minutes to calm him down. We did not eat at any of the “premium” dining options that included an extra cover charge. I enjoyed our stateroom quite a lot. The oversized balcony was certainly the star, but it also had useful touches like high storage shelves for baby stuff. For not much of an upcharge over a regular “balcony” room, I thought it was worth it. Dining, on the other hand, rated a disappointment overall. Poor service at the buffet, combined with disappointing food quality in the main dining room, left me wanting more.